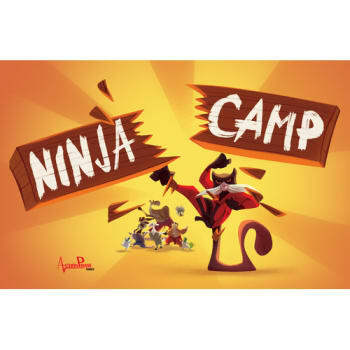 One of the Small Box/Big Fun line of games from Action Phase Games, Ninja Camp pits animal martial artists against one another in a training exercise where the best will become the personal ninja apprentice of Sensei Saru. Each player starts with two cards, each representing a ninja skill, with the rest of the deck making up the game board. By using the cards in their hand, players navigate the board, adding new skills to their hand as they do-and leaving fewer movement options for their fellow campers. Each player also has a unique ninja ability that he can use once per game to try to turn the game in his favor. A game that sets up and plays in thirty minutes or less, Ninja Camp is sure to provide hours of fun for families and future ninjas!